Ghanian children’s book writer Meshack Asare discusses his mission to cover the rich regional diversities of Ghana and the continent as a whole. Earlier this month World Literature Today announced Meshack Asare as the winner of the $25,000 NSK Neustadt Prize for Children’s Literature. Given in alternating years in conjunction with the Neustadt International Prize for Literature, the biennial NSK Prize recognizes great accomplishments in the world of children’s storytelling. 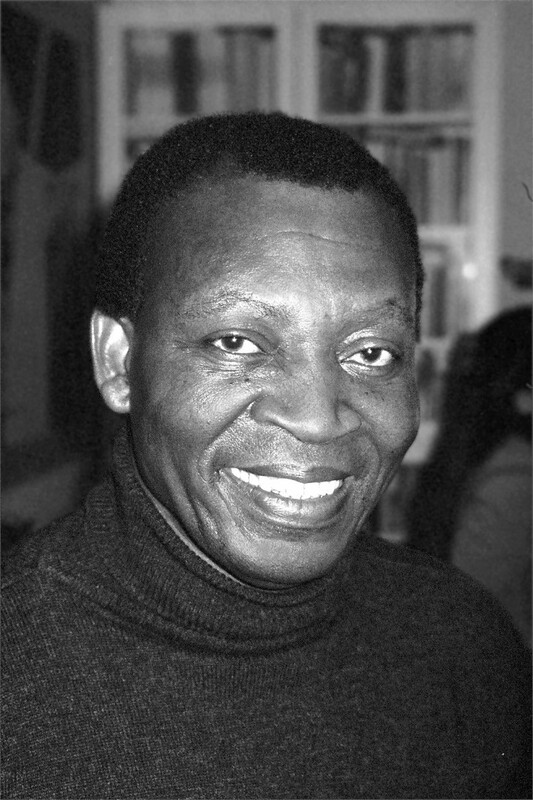 Asare is the first African writer to take the prize. Born in Ghana and currently residing in Germany, Asare is considered one of Africa’s most influential children’s authors. 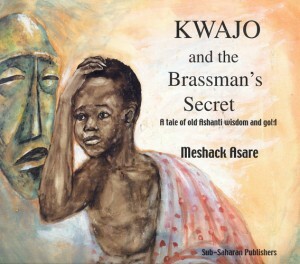 His representative text cited by the NSK was the multiple award-winning picture book Kwajo and the Brassman’s Secret, an Ashanti tale about wisdom versus the temptation of riches, distributed by African Books Collective. I had the opportunity to interview Asare via email about the award, his career, and children’s books and storytelling in Africa. What was your reaction to hearing the news about your award? Naturally, I am delighted and greatly honored as such a prestigious award bestowed by a truly distinguished Institution is immense recognition of my role in Africa’s contribution to Children’s Literature. Can you tell me a little about your career? I’ve read that there was a ten year period when you were unable to get any work published — could you talk about that as well? As a child I had the advantage, unlike most other children in the town, of having a father who loved to read, so there were many books and magazines at home, though no ‘children’s books’ beside school textbooks. I grew up during the years when the well-educated and talented were constructing the foundations of intellectual capital and cultural identity for our newly independent country and I was fortunate to be close to some of them. For my part, I simply took on the task of creating books in which children, their real life experiences and familiar surroundings were the focus. I started as an illustrator then went on to plan, write and illustrate. My first success was Tawia Goes to Sea (GPC 1970) which received the UNESCO Citation and went international. However over the following decade and more, the country’s economy continued to be dire and much printing and publishing activities ceased for lack of imported spares, supplies and particularly, paper. In 1981 when The Brassman’s Secret, was published, actually printed on pink poster board, it was thanks to an adventurous local businessman who brought it from Brazil. My next book The Canoe’s Story (Miracle, 1982) was also published by another daring local businessman on bond paper. Following these experiences and difficulties I left to study in the UK and try to pursue more writing from there. I wrote and illustrated Cat in Search for a Friend in the UK but did not find a publisher there. I took it to the Frankfurt Book Fair and the first publisher I showed it to JUNGBRUNNEN (Austria, 1984) offered me a contract and it won the Austrian National Prize and the BIB Golden Prize (1985). I have since, written and illustrated a number of quite successful books of African background for children and young people. I had aimed to cover the rich regional diversities of Ghana initially then the continent as a whole, but I have only managed three regions of Ghana and one each about Zimbabwe, Lesotho, Botswana and South Africa. I have also tried to help in other ways, to raise the quality of writing, illustrating and publishing for children and young people in Africa, often as a trainer in workshops, writing reviews, empaneling competitions and presenting papers at institutions and conferences. What kind of stories did you grow up hearing? And reading? And was there a strong line between oral narrative and written? We often heard folktales first hand from our parents and grandparents – it was possible at that time. By the time I had my own children this had already changed, owing mainly to urbanization and consequent disintegration of the traditional family system. We did not have story books, except our school textbooks. The English language books were imported from the UK and much later, supplementary readers which included a few Readers’ Digest publications. These enabled us to read some stories from and about faraway places. The books in our local languages were usually published by missionaries who had previously used the vernacular languages to translate the Bible, which meant that our local language books were firstly, extensions of that project. Other than that, they mostly contained folktales that had been selected for their moral values. In that sense, those books only continued with the oral narratives, except that they could be read in collected form. I am of the opinion that throughout, that practice has impacted strongly on Africa’s literary outlook. What inspired you to write The Brassman’s Secret? How does it differ (if at all) from the “traditional” story? As an artist, I couldn’t help admiring the sculptural power of ‘gold weights’ and wondering in awe at the mystique around them. I watched craftsmen producing them when I visited my grandmother, though disappointingly, only for the tourist market. My inspiration came initially from owning a set that I could look closely at and touch as frequently as I wished and contemplating as I did so. They grew and grew until I really had to know more about them – then imagination did the rest. The meanings of wisdom deriving from the various figures in the book are traditional, just as the historical context. Kwajo’s magical experience is however, fiction. People outside of Africa talk about “African literature” as though it was just one kind of thing, which obviously, it’s not. How do children’s books and stories in Ghana differ from those in other parts of Africa? The cultures of Africa may be defined as North African and Sub-Saharan although the impact of colonization and trends in literary development do not radically differ. As the peoples and cultures of Sub-Saharan Africa are closely inter-related, their literatures also share common traditional influences such as oral narratives. However there are regional variations deriving from differences in environment and experiences. Other than such variations, the patterns of development, outlook and perhaps mind sets that create children’s books and stories across Africa, are similar if not the same. Having said that, quality of production has improved greatly in Ghana and it has always been of higher standard in Southern Africa including Zimbabwe, although wide discrepancies still show elsewhere. If I’m correct in believing (and correct me if I’m wrong) that a great deal of children’s literature in Africa comes from the oral tradition, how is technology changing that? What changes have you seen? And how has it affected your storytelling? From reading numerous manuscripts and storybooks from across Africa, my estimate is over sixty percent of current children’s literature is either folktale retold, or folk narrative inspired. This estimate is lower in North Africa and far lower still in South Africa for obvious reasons. However especially in Nigeria and to some extent Ghana and I believe in Kenya as well, a great deal of folk narrative are absorbed into digital media: video, TV, film and audio discs. I am aware that work is being done in Ghana at the moment to adapt Ananse stories for these technologies and I am not sure if it is any different in other African countries. I have mentioned elsewhere that our writing is still heavily dependent on folklore for inspiring material and to some extent, style. I think that via these technological media, our oral tradition is quickly migrating to the future. How would you describe children’s literature and publishing in Africa (or just in Ghana if you’d prefer) today, and where do you see it going in, let’s say, 10 years? I am happy that in Ghana and throughout Africa, children’s literature now stands fully recognized by the publishing industry, education and the public. Children’s literature is not merely extension to some adult project and publishers who are dedicated publishers of children’s books are emerging in various African countries. It will still be quite a while before we attain the levels of sophistication and flair of Europe, America or Asia, but there is no shortage of talent and determination.